So QLD won Game 2 huh? Moving right along... nothing to see here, we're going to a decider - less said about my Lang Park experience the better... it was handy, bar the result of course. 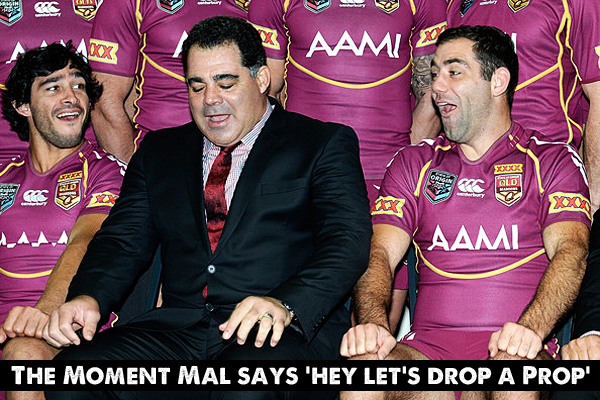 So the big Late Mail news is Cameron Smith, James Maloney and Paul Gallen definitely won't back up (and Trent Merrin is suspended for a week)... so The Postman's advice is below - TIME TO FRET! PLAYER OF THE YEAR: Inglis in pole-position? Plus Origin 2 Votes. With 15 Rounds in the books for 2013, here is a look at the current leaderboard in the The @NRLTweet Player of the Year Awards. 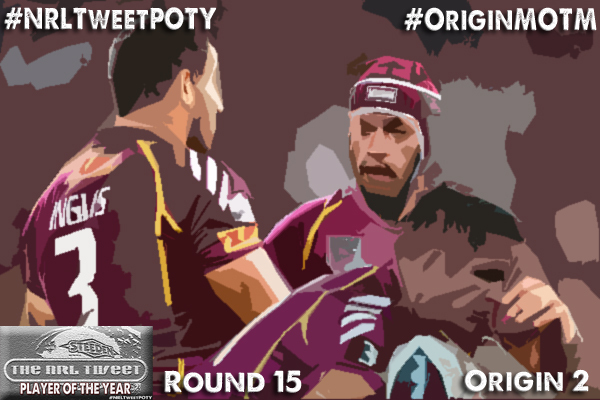 Plus we reveal which Queenslanders featured heavily in the Man of the Match Votes from Origin 2. 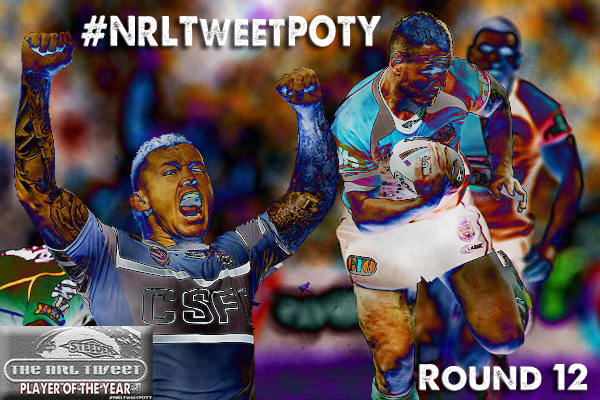 Melbourne's Cooper Cronk still has the lead in the 2013 #NRLTweetPOTY Awards but his QLD team-mates Greg Inglis and Johnathan Thurston are now within striking distance through 15 rounds of the year. Was it Blake, Josh, George or Mal? 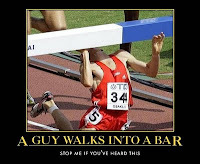 Okay admittedly that's the first joke I've written in a very long time... that is actually half decent. So forgive me for leading the Game 2 Team Analysis with it. Here are my thoughts on the teams picked for Game 2... prepare yourself, it isn't a big bouquet of rosy endorsements. Analysis: Where have all the front rowers gone? QLD's greatest strength through their streak (after the fact they've got 6 or 7 uberstars) has been their prop rotation and due to injury and retirement they went into Game 1 without Ben Hannant and Petero Civoniceva from the 2012 series... and got beaten in the middle. So instead of bolstering Matthew Scott and David Shillington with another prop or two - they dropped Shillington for a backrower (admittedly a handy one in Josh Papalii) and replaced another forward - Ashley Harrison with a halfback in Daly Cherry-Evans. Are you scared that NSW's somewhat mobile team has the right formula? 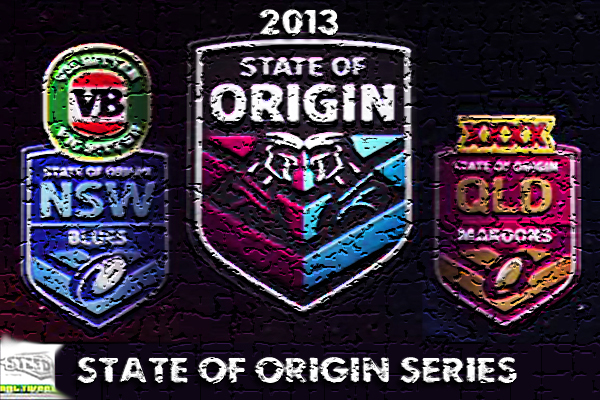 Game 1 was NSW's for two reasons: 1. NSW won the ruck emphatically in the 1st half, and 2. 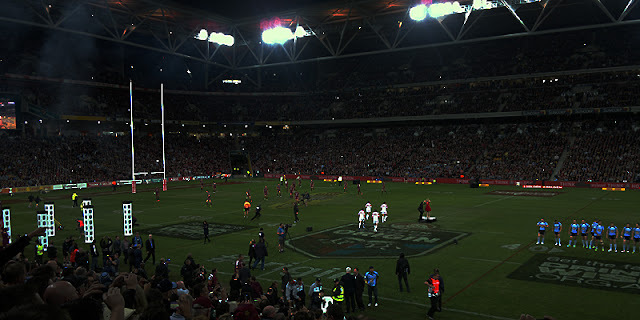 QLD's superstars weren't allowed to get into the game as a result. So why wouldn't you pick a team that can wrest some dominance back in the middle and let your superstars have more than a couple of chances in Game 2? Evidently - that's not the plan. 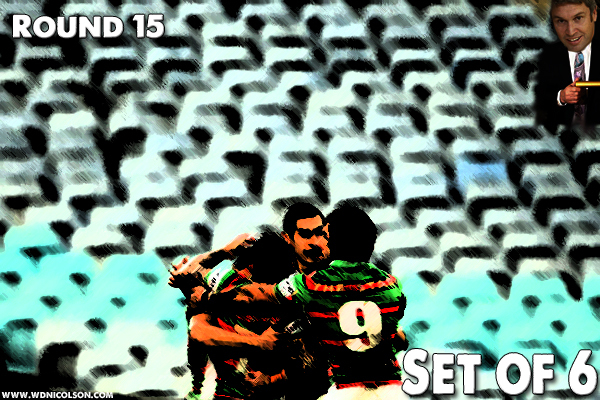 Continue reading below for the Round 15 Tipping Preview. Was it Blake, Josh, George or Mal?! Anyhoo... onto the footy. Origin 2 is next Wednesday in Brisbane - so only 8 teams are playing in Round 15, and of those 8 teams - they don't have their Origin stars. So realistically - don't expect much in terms of quality this weekend, but hopefully a game or two is half decent and the stars who are still playing do the business. 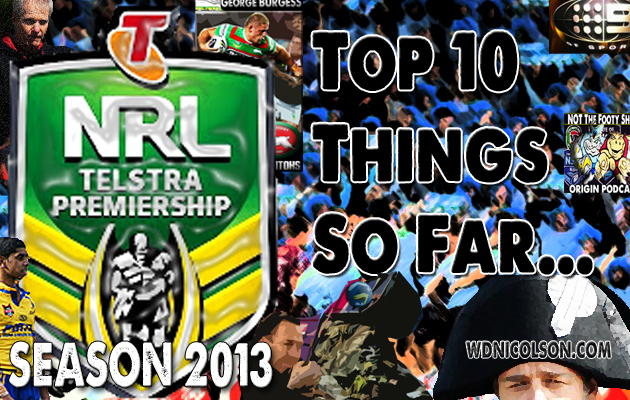 With 13 Rounds complete in 2013 and every team now having played half their regular season schedule, here is a look at the Top 10 Things www.wdnicolson.com likes about the NRL Season so far. So what have been the best things to happen so far in Season 2013? 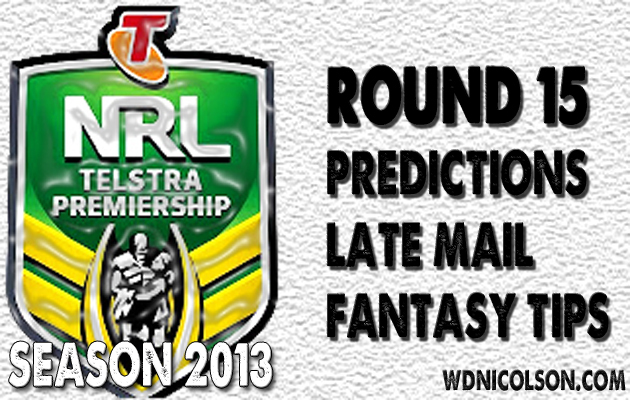 Continue reading below for the Round 14 Tipping Preview. 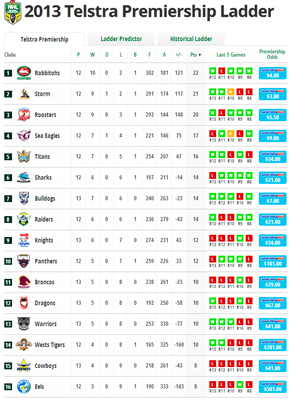 The second half of the 2013 NRL Regular Season officially begins this weekend, and looking at the ladder - we've got three quality sides, a decent side and a bunch of pretenders. South Sydney and Melbourne are the standard, with the Roosters showing they can back up their early season surge. Manly have dropped away in recent weeks without Brett Stewart - but remain by far and away the fourth best side in the competition. Cronulla, Canterbury and Canberra have 14 points (at least 6 wins) to round out the Top 8, followed by Newcastle and Penrith 12 points (at least 5 wins) and then Brisbane, St George Illawarra, Warriors and Tigers have 10 points (at least 4 wins). Not that far behind - though they bring up the rear in 15th and 16th - North Queensland and Parramatta have 8 points (Cows have 4 wins, Eels have a league low 3). Oh and if you are wondering why some teams are on the same amount of points but have less wins... that's the beauty of the BYE. It's a little confusing for teams to get 2 points for doing nothing, but for some reason giving teams 2 points for a bye is apparently more logical than not giving them any points for doing nothing - per the official premiership ladder scoring system. In short - 3 teams are playoff certainties, Manly are too good to miss out from here and the rest are playing for the other 4 openings in the Top 8. Welcome to the 2nd half of 2013. With 12 Rounds in the books for 2013, here is a look at the current leaderboard in the The @NRLTweet Player of the Year Awards. Also included is the Man of the Match Votes from Origin 1. 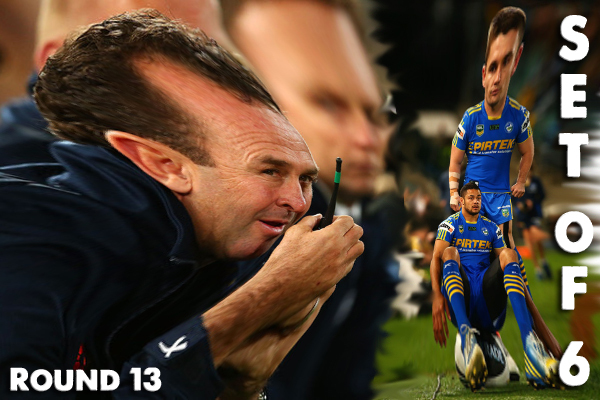 Continue reading below for the Round 13 Tipping Preview. With Origin 1 in the books and NSW taking a rather commanding 1-0 lead (as 1-0 leads go after losing 7 straight series) after a 14-6 win over QLD - attention turns to which Origin players will backup in Round 13 of the NRL this weekend. Origin 1 wasn't as brutal as ones we have seen in the past, but a number of stars are in doubt to backup and at least one - Robbie Farah - might not be right even for Game 2 in Brisbane in late June. For those playing at home - South Sydney are the unofficial Minor Premiers of the halfway mark of the competition, as they have a bye this weekend and will maintain at least a one point lead on Melbourne through 13 rounds. The reason this went up Thursday night instead of its usual Wednesday afternoon slot - ORIGIN. No point putting out Late Mail before a game like Origin... and of course, injuries/resting players impact who we all tip right? NSW win series 2-1... Feel free to post your picks below. 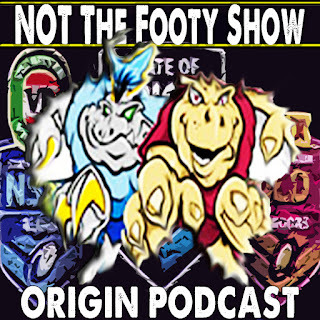 And if you need to fill an hour of your Wednesday waiting for the game... give our one-off Origin Special a chance to take the edge off the wait. 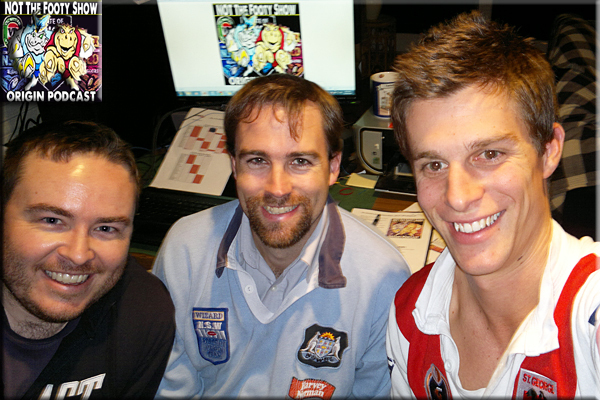 The team reunites for an hour and a bit of Origin chat, a dash of fun and perhaps, some frivolity. Warrick Nicolson is joined in studio by Nic McInerney and Dave Chapman to preview The State of Origin Series and Game 1 with guests Jake Hauritz, Matthew Duncan and a special appearance by the Queen of Rugby League Maria Tsialis. We're not coming back by any means but we thought this might be a good excuse to catch up with friends and a treat to those fans who actually miss us every week. We'd love to hear if you enjoyed the show and who knows we might see you again if the Blues win the series! LIKE the show on Facebook to discuss the Special. 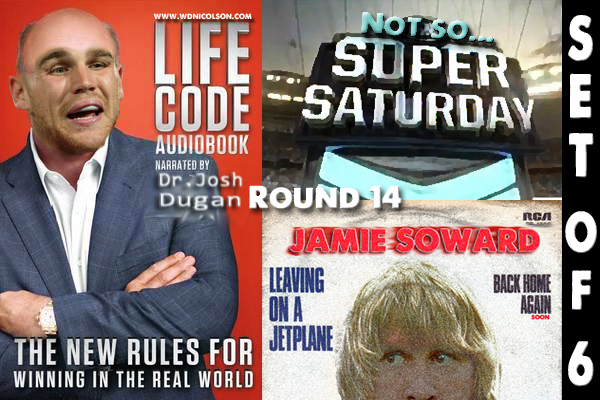 NOT The Footy Show is no longer running every week... there's still plenty of NRL content at www.wdnicolson.com however, so check it out. Pick the Score (Margin): ? Over/Under 33.5 total points: ? Man of the Match: ? Feel free to post your picks below.